BIGO LIVE Singapore, together with their broadcaster Jo Ann Chen, recently teamed up with Cerebral Palsy Alliance Singapore (CPAS) and another popular BIGO LIVE broadcaster Charis Koh, to help raise funds and awareness on BIGO LIVE platform. They spent an afternoon at the center to bring joy and laughter to the lovely children at CPAS. Jo Ann (ID:JoAnnchen) used BIGO Live to raise “beans” – points awarded according to how many viewers she can get – through the whole stream day. 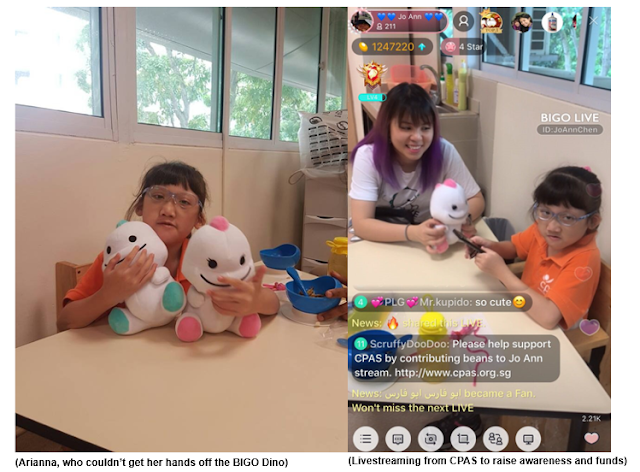 Her 174,856 beans was converted into SGD 1123.20 and BIGO LIVE Singapore matched the funds raised dollar-for–dollar, that went straight to fund therapy equipment, medical expenses, diapers and food rations, public education and caregiver support - not counting BIGO Live’s own donations to the cause!. In total, the funds raised amounted to SGD 2246.20. 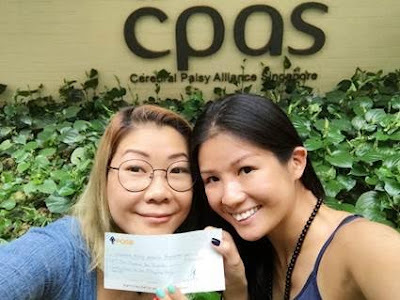 BIGO Singapore, broadcasters Jo Ann and Charis Koh spent an afternoon at the center to learn more about cerebral palsy and the early intervention and therapies available. There was an introduction to CPAS, followed by a tour of the facilities where they had the opportunity to meet wonderful children like Arianna (who couldn’t take her hands off the BIGO Dino), and Jerryl (who received a thumb drive he wished for as a present from our streamers). 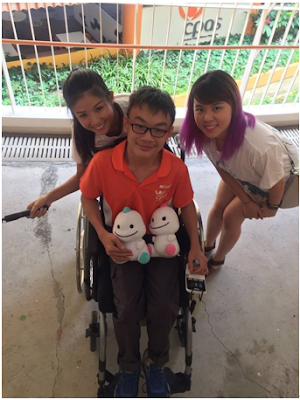 Jo Ann and Charis also had the luck to meet with Wei Lun and Bing Yao, two individuals with cerebral palsy whose artistic talent is on display at CPAS’ Art Gallery, and their artwork available for sale. Jo Ann went an extra mile and supported the cause, spending an additional SGD 500 on artwork from this fantastic gallery, and found out that Wei Lun is also a BIGO user! “It really touches my heart to see everyone together to make it possible. It means so much to me to see my supporters in the stream during the charity drive. I can’t list all of you, but I know who you are, and I hope you can feel my gratitude” said BIGO LIVE Broadcaster Jo Ann Chen. “This is an extremely good cause and the event had been very successful. We hope that by our little action of sharing this on livestream with our viewers, we would be able to bring about more awareness for CPAS. And that many more individuals who are suffering from this condition would be able to live their life to the fullest and to live the moments without the public misconception about their condition. We hope that more people are able to benefit from our small act of kindness. Thank you CPAS and definitely our broadcaster Jo Ann for her extra mile of kindness. We are also very heartened and delighted to see many kind souls on the platform who had supported this cause, thank you so much.” Ms Cherylene See, BIGO LIVE Regional Marketing manager.